Joan González Fabra, PhD student under the supervision of Prof. Carles Bo (ICIQ), has defended his PhD Thesis entitled “Computational Design of Catalysts for Carbon Dioxide Recycling” (assigned to the Inorganic and Physical Chemistry Department of the Universitat Rovira i Virgili) publicly on October 9th at URV’s Chemistry Faculty. 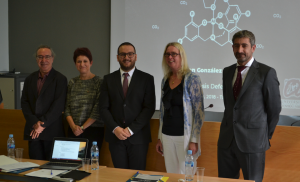 Dr. Fabra with his supervisor, Prof. Carles Bo, and the evaluation committee. Dr. González is a proud Deltebre citizen and joined Bo’s group at ICIQ in 2014 to finish his B. Sc. Project. In 2015 he enrolled as a PhD student to work on the project “Computational Design of Catalysts for CO2 Fixation,” for which he got an FPI-Severo Ochoa grant in 2016. I have always loved science, especially physics and chemistry. I think it’s because I’m very curious and I want to know why things happen. I studied chemistry because it’s a general topic that relates to different things – I really enjoy it! As a scientist, I’m very interested in green chemistry. I’d like to improve the current industrial processes to reduce waste and to create processes that use CO2 or other substrates which are now considered waste as feedstock. I think we need to move forward in this direction. I started at ICIQ as an undergraduate student, so I have learnt a lot from both a personal and a professional perspective. My thesis supervisor, Carles Bo, is eager for us PhD students to learn as many things as possible: from computational chemistry techniques to different programming languages, and this is great for us students. But the one thing I value most is that I have learnt how to work in an efficient manner: now I am able to distribute my time efficiently, and I think this is very important from a professional perspective. What ICIQ moment you´ll never forget? I work in the “theoretical lab” and when any of us comes back from vacation – or any kind of travel, for that matter– it’s almost compulsory to bring a sweet snack to share with everyone in the lab. Quite often we gather around the table to munch some snack or other, drink some coffee and chat. We all meet there and talk about science or other stuff and it’s very nice. It’s kind of a tradition by now, and I think it’s great! I’m staying at ICIQ another year, I’ll finish some projects that are still running and work on multiscale metadynamics, a technique that allows us to study complex systems from a different perspective. I think it’s a really interesting technique, different from what we usually do. I am still thinking what I’ll do after I leave ICIQ next year, but I’d like to continue doing research, either in academia or industry I don’t know yet, but I still have time!